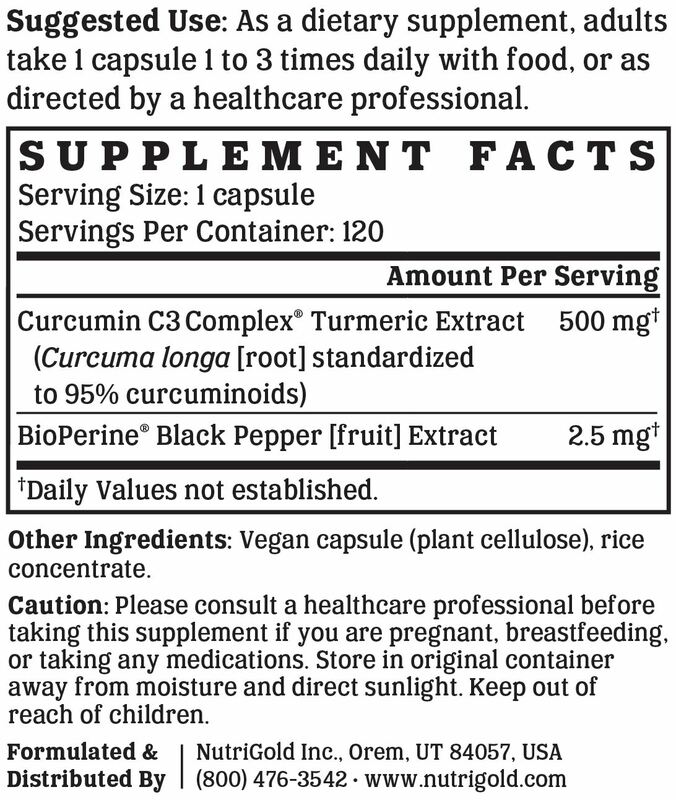 Not all turmeric supplements are created equal-- Curcumin C3 Complex is the most clinically studied turmeric extract. It is standardized to 95% curcuminoids, including curcumin, demethoxycurcumin, and bisdemethoxycurcumin, in a patented ratio, and has been proven in multiple clinical studies to be therapeutically beneficial in supporting joint, cognitive, and liver health. Turmeric Curcumin Gold is formulated using Curcumin C3 Complex along with BioPerine, an extract of black pepper shown to enhance the bioavailability of curcumin. Turmeric Curcumin Gold is manufactured in the USA to industry-defining quality standards and is verified by independent third-party labs to meet identity, purity, and potency label claims. Curcumin is a compound in the roots of turmeric (Curcuma longa), is the most popular spice in Indian cuisine, and is responsible for the extract's bright yellow / orange color. Turmeric has a long history of medicinal use in India and has been the subject of almost 3,000 pre-clinical investigations. The active ingredients in turmeric, responsible for the medicinal root's abilities to support the body's immune response and protect cells from free radical damage, are called curcuminoids. The three major curcuminoids identified in pre-clinical investigations as having the most biological activity are curcumin, demethoxycurcumin, and bis-demethoxycurcumin. Curcumin, in particular, is noted for its antioxidant properties and is one of the best studied products in biomedical literature at a pre-clinical level. Turmeric Curcumin Gold is Non-GMO Project Verified, which provides assurance that the product has been manufactured in accordance with the best practices for GMO avoidance. The Non-GMO Project is North America's premier verification program. Vegan Action has offered vegan certification since 1995. Their official seal is proof that Turmeric Curcumin Gold does not contain ingredients derived from animals or animal by-products, is free of animal-derived GMOs or genes, and is not the subject of ongoing animal testing. Most consumers consider kosher products to be cleaner, healthier, or better than non-kosher products. The Ko Kosher symbol on Turmeric Curcumin Gold is assurance of our brand's unwavering and uncompromising commitment to accountability, quality, and overall safety. ConsumerLab.com is the leading provider of independent test results and information to help consumers and health care professionals recommend quality health, nutrition, and wellness products. Their official endorsement of Turmeric Curcumin Gold is a reflection of its quality. We like to make supplements that can be enjoyed by everyone. That's why our products are always compliant with the best practices for avoiding allergens and minimizing cross-contamination. 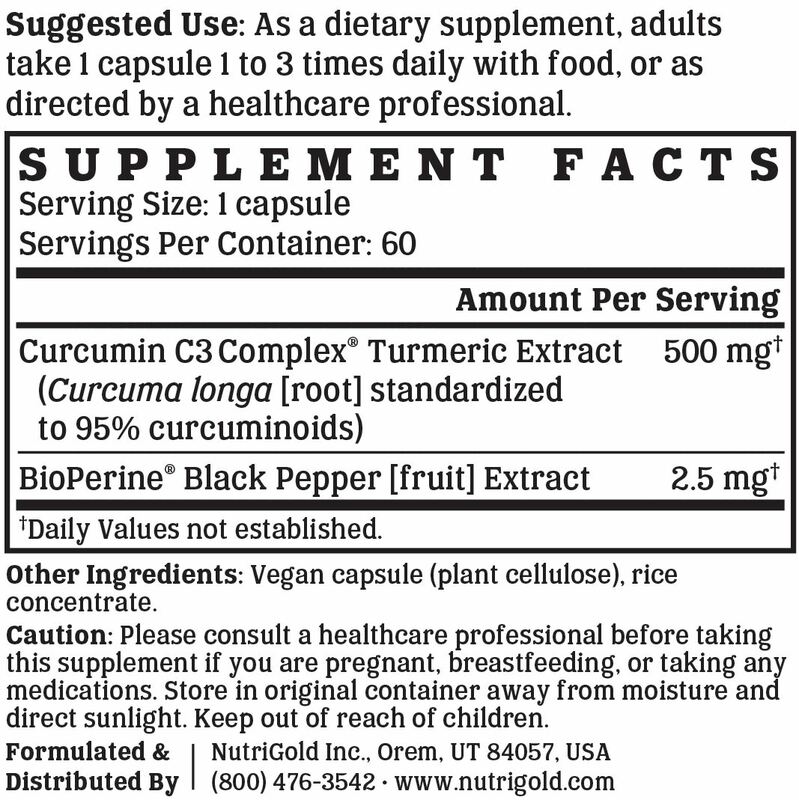 Turmeric Curcumin Gold is free of soy, gluten, egg, milk, peanut, shellfish, and corn allergens. Consistent with our guiding principle to “do no harm,” Turmeric Curcumin Gold is manufactured without the use of additives or preservatives. It contains absolutely NO contaminants, pesticides, herbicides, harmful additives, residual solvents, magnesium stearate, or hexanes. Like all NutriGold products, Turmeric Curcumin Gold is subject to over 140 purity and potency assays by independent, third-party labs to ensure that the product meets or exceeds its claims. So, you can be certain that what's on the label is what's in the bottle. Nothing more, nothing less.